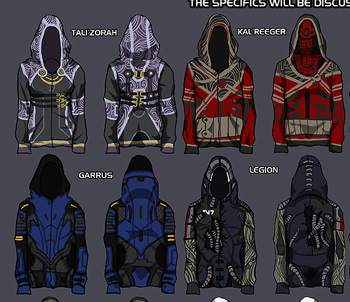 One fan's awesome Mass Effect hoodie designs are getting the official treatment from BioWare. You might recall Christine Schott's designs for hoodies based on Mass Effect costume designs. They cropped up on various news sites after she posted them on Deviant Art back in April. I assumed the concept art to the right would be the last I'd ever see of the project, but rather surprisingly, BioWare has decided the idea is just too cool to ignore. According to Schott, the Mass Effect 3 developer intends to produce apparel based on her designs. No word on when we'll be seeing the finished product, however. As she wrote on her Deviant Art profile. "Yup, thats right. I had a talk on the phone yesterday with a couple of people who are part of the team that make official mass effect apparel. they were really nice people, and I was a nervous wreck. XD it was agreed their designers will be taking on the hoodie project! Chances are my hoodies are nowhere near the final product, after all I'm no true designer and haven't got the slightest idea what looks good on clothing and what doesn't. I just conceptualized the idea. they will be redesigning the hoodies, and will sell a few as a trial run, and if it goes well more hoodies will be added I'm sure. Though there's been no official word from BioWare or EA just yet, Schott assures fans she's being compensated for her work. Bonus points to the first person caught fighting crime in their new Garrus hoodie.